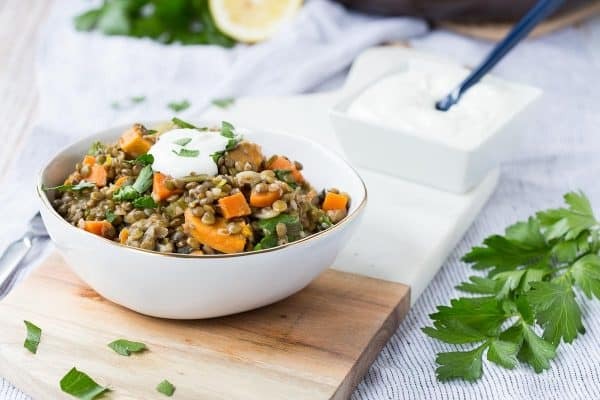 One Pot Green Lentils with Sweet Potatoes and Kale are a hearty vegetarian meal – easy to make and packed with nutrition and flavor, these are sure to become a favorite! When I think lentils, my mind automatically goes to delicious health food. 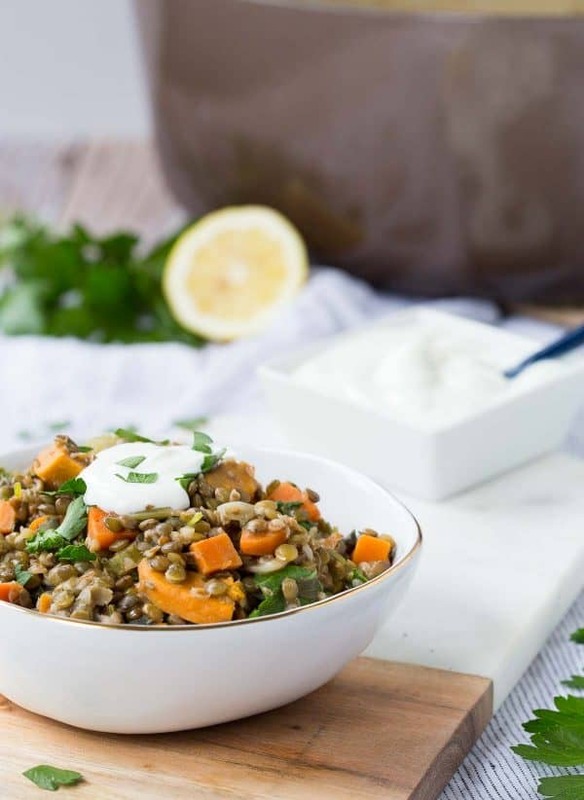 Lentils are a versatile powerhouse and so tasty. I love using red lentils to make a smooth, comforting red lentil soup. My go-to use of green lentils has always been in salads because they hold their shape well and stand strong in a salad. 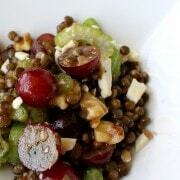 I love this lentil salad with grapes and orange, or this lentil salad full of feta and bright, fresh flavors. Lentils also make a great stand-in for meat, like they do in my vegan bolognese. 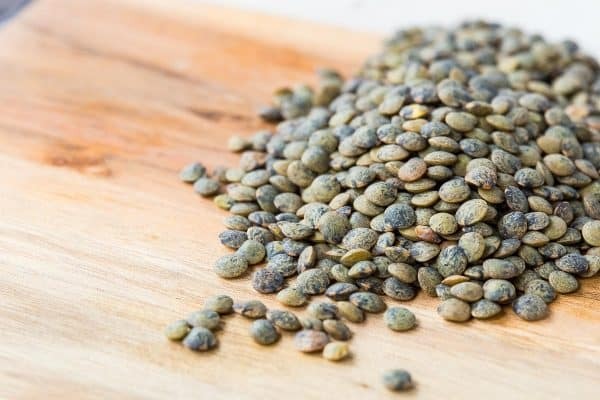 French green lentils are so beautiful and they have a really great peppery, earthy flavor. I’ve done soups and salads but I wanted something heartier than a soup this time. An easy, one pan, healthy comfort food recipe. This one will be great for meatless Mondays (or any day of the week!). It’s a great back-to-school weeknight meal because you only have to wash one pan. ONE! Pretty much a mom’s dream come true. You could prep the carrots, celery and onions the night before and have them waiting in your fridge to make this recipe even easier and quicker when you get home from work or sports games or whatever you may have going on. 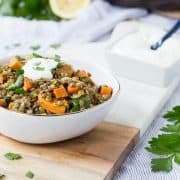 I used baby kale for a good dose of greens in these one pot green lentils but if you don’t have baby kale on hand, you could use spinach or chopped curly or lacinato kale. I like to top this recipe with a little plain yogurt, a squeeze of lemon juice and a good sprinkle of fresh parsley. It’s a very hearty dish and those three toppings add the brightness and acidity it needs. Heat olive oil in a large pot or dutch oven over medium heat. Add onions, carrots, celery, salt and pepper. Cook, stirring occasionally, for 10 minutes until the vegetables are beginning to soften and onions are translucent. Add garlic and cook, stirring for 1 minute or until fragrant. Add the wine and scrape any brown bits off the bottom of the pan. Cook for 2-3 minutes or until wine has reduced by about half. Add lentils, bulgur, sweet potato, broth, parsley, and thyme and increase heat to high. Bring to a boil and then reduce to medium-low to simmer for 30 minutes or until lentils are tender, stirring occasionally. Add more water during the cooking process as needed (I needed to add two cups) to keep the lentils just barely covered with liquid. Add baby kale and cover for 1-2 minutes. Uncover, stir, and repeat as needed until kale is wilted. Sprinkle in lemon juice and stir to combine. Taste and add salt and pepper as needed. Serve garnished with plain yogurt and fresh parsley. Store leftovers covered in fridge for up to a week. Note: This would be a great recipe to meal prep on the weekends and keep in the fridge for healthy eating all week long! Verdict: Comforting, healthy, and flavorful. Oh and easy. Pretty much a win-win-win-win in my book. Husband’s take: He likes to eat it cold with tortilla chips. Please keep in mind I am not endorsing this choice. I am only sharing the facts here. Actual nutrition may vary depending on how recipe is prepared. Does not include toppings. 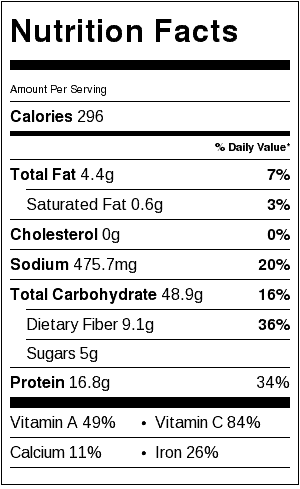 Nutrition info for 1/8 of recipe. Disclosure: I’ve partnered with Bob’s Red Mill as a brand ambassador to bring you this post. They compensated me for my time but all opinions are, as always, my own. If you opened my cupboards and fridge, you’d find a wealth of Bob’s Red Mill products that I purchased myself. Thanks for supporting Rachel Cooks by reading about brands I use and love! I made this recipe because I wanted a soup. I followed your recipe Rachel and it was absolutely delicious. Thank you. So glad to hear you liked this recipe! Thanks for taking the time to come back and leave a comment! For a little more umami I added 1 Tablespoon of Worcestershire sauce and 1 teaspoon of soy sauce. I topped it with yogurt and blue cheese crumbles. Very nice and really quick and easy. Great idea! I can’t wait to try it with your additions. Thanks for taking the time to come back and leave a comment! The recipe lacked a savory note, maybe could have used a different spice blend to make it more appealing. I’m sorry to hear you didn’t love this recipe! 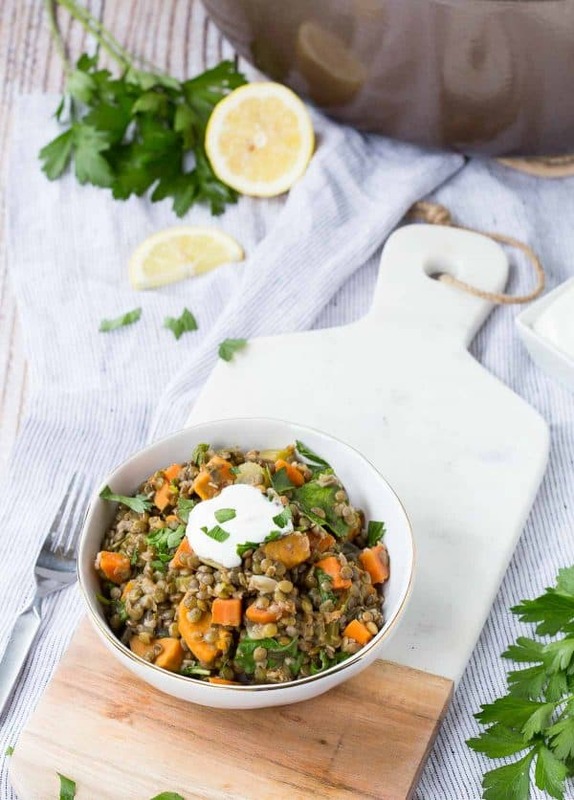 This is a favorite of a lot of people and I think the earthy lentils, onions, celery, parsley, thyme, and kale all add great savory elements. What would you add to it next time you made it? Maybe you’d like it with a sprinkle of cumin in the spices, or a dash of hot sauce on the top. I’ve made this recipe twice now and absolutely love it. I recently started weight watchers and I’ve calculated a serving is only 3 points! This meal feels like an indulgence not healthy food. Oh I’m so happy to hear that! Thanks for taking the time to come back and leave a comment, it means a lot to me! :) Good luck with WW! Just made this and I’ve been eating it all week. Cannot get enough! My mother, husband and son also loved it! This is a keeper, for sure. I’m so happy to hear that! Thanks for taking the time to come back and let me know! 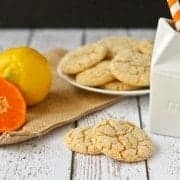 My boys would love this healthy and delicious recipe! I have such a love-hate relationship with lentils. The first time I tried them they were plain and a bit too earthy for me BUT then I tried them with spice and I was hooked! I love the addition of sweet potatoes and kale in this delicious side dish or meatless meal! Oh they are so good! But they definitely need to be prepared the right way. :) You would love the red lentil soup too. 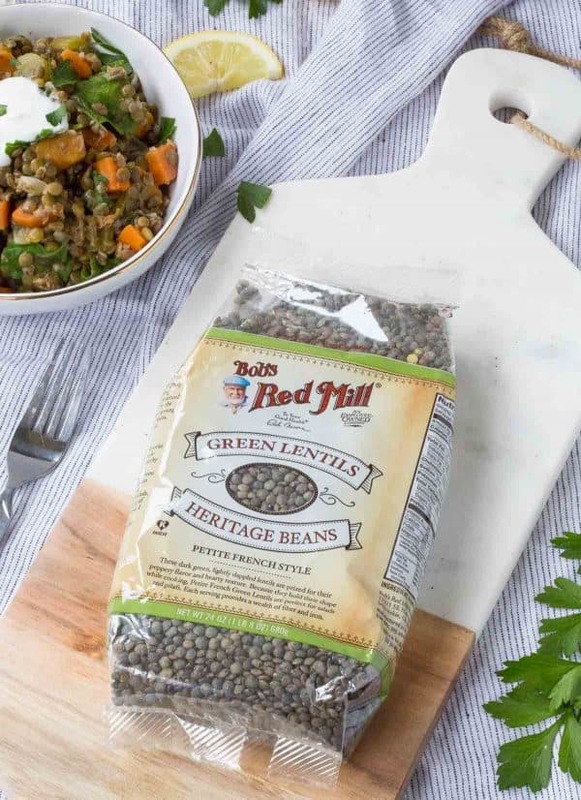 Ben and I love lentils – we do come from the land of lentils in Eastern Washington, so there is never a shortage. But this is one heck of a way to use them!! 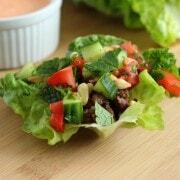 What an awesome, healthy meatless Monday idea!